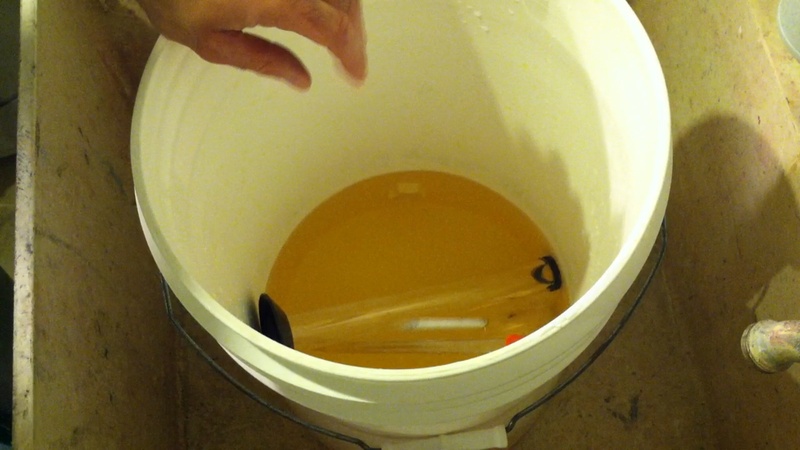 The last time you need to do any sanitizing during the brewing process is before kegging or bottling. Here I’ll be sanitizing my corny kegs before racking my beer to them. The two brands of sanitizer I’m most familiar with are Iodophor and Star San. As of this video, I typically used Iodophor; however today, I’ve been using Star San more. Star San foams-up and is good for getting into small crevices and hard to reach places. Star San is acid based, so it’s not good to leave it on things like stainless steel and plastic too long, but I doubt the dilutions used here would do much short-term harm. Iodophor is not an acid so it doesn’t eat through stainless steel at all, but can stain plastic items if left soaking in it too long. Today I’m going to mix up a little sanitizer to sanitize my kegs and equipment. The most popular brands are Iodophor and Star San. I typically use Iodophor; however I’m going to start using Star San more. Star San of course bubbles up and is good for getting around a lot of different things. With Iodophor, it yellows equipment if you leave it on plastic too long and it starts to stain a little. Iodophor is not really an acid so it does not eat through the stainless at all. I don’t believe the Star San does either in the quantities I’ll be using, but it may have some long term effect. I will be using Iodophor. The directions, specifically for home brewing, call for one teaspoon per one and a half gallons of water. 1:17 I start by putting one and half gallons in my bottling bucket, then add the Iodophor and mix. From what I read on their website, as long as it’s still a yellow/golden color then it should still be good to use. Keep it in a dark place while storing, and it has an odor you will get used to. After it sits for a few weeks, even in a dark closet where I keep mine in a bottle, it still has a light yellow tint to it (not as dark) and smells like it’s fine. But, I usually don’t take the chance at this point with it though because it is so inexpensive to change it out. 2:26 Now I can start sanitizing a few things, starting with the bottling tube I take my samples with. Although you don’t need to sanitize everything here, because it does not all come in direct contact with the beer, I’m going to anyways because I’m always touching things while taking samples from the carboy. You have to keep things in contact with the solution for two minutes – fully immersed. I have read online that you do not have to rinse this stuff as long as you follow the dilution directions. 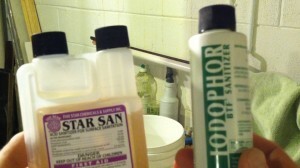 Both Iodophor and Star San are no rinse products. 3:19 Now I’m going to start sanitizing my kegs. I’m going to pour a little sanitizer in each, cap them up, and shake them. Remember, it has to contact all surfaces for at least two minutes. Once I’m done I’m going to pull everything apart and soak them separately in sanitizer to ensure everything it sanitized well. I’m going to keep all the parts in a container and let them soak. 4:35 Don’t forget to clean the auto siphon as well in sanitizer, then put everything back together once the sanitizing is complete. I’m also going to use my sanitary keg lube to lubricate any of the rubber seals. You don’t need to use much of this. This will give everything a better seal as you reassemble as well.